The Howard Theatre is nearly complete. You may have noticed that the sidewalk on the north side of T Street is now open, giving residents a close-up view of the new façade. 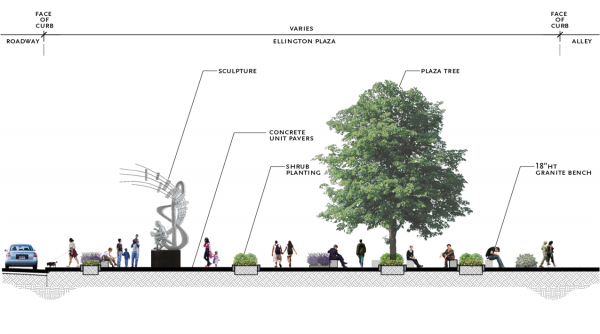 More importantly, the plaza at T Street and Florida Avenue is now open and the new sculpture of Duke Ellington stands prominently at the vegetated plaza. 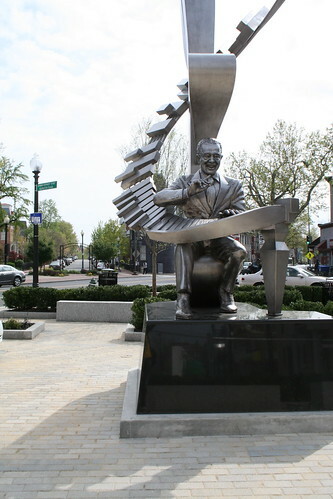 The sculpture depicts Ellington seated on a treble clef while playing a piano keyboard. 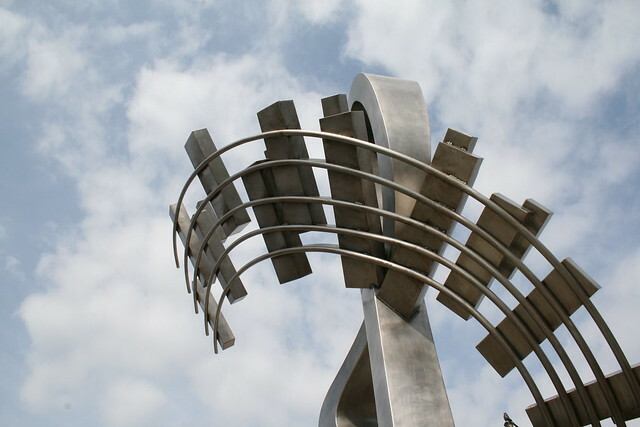 The most delightful feature of the sculpture is the energy it portrays. As Ellington plays, the keys appear to fly off the keyboard and into the sky behind him, signifying a magical quality to his music. 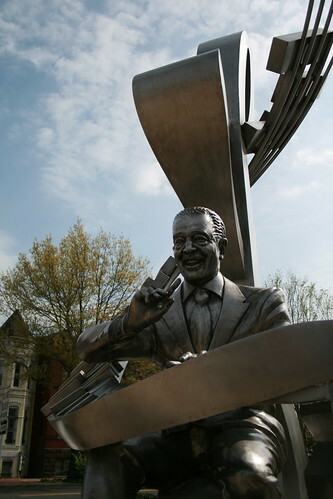 Duke Ellington grew up in Washington and even lived on Elm Street in LeDroit Park for a year. 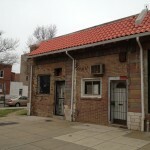 He played at the Howard Theatre and frequently visited the adjacent Frank Holliday’s pool hall, most recently known as Cafe Mawonaj. And now Ellington’s statue sits on the same storied block. Channel 7 ran a short story on the fracas over the All Souls tavern license we reported earlier. Unfortunately we weren’t able to make the Alcoholic Beverage Control (ABC) Board hearing on Wednesday, but we heard secondhand that it was quite a show. A commenter from a previous post pointed us to an article sympathetic to the opposition. The article notes that the ABC Board does not typically grant alcohol licenses within 400 feet of a school unless there is already another alcohol license within 400 feet of the school. 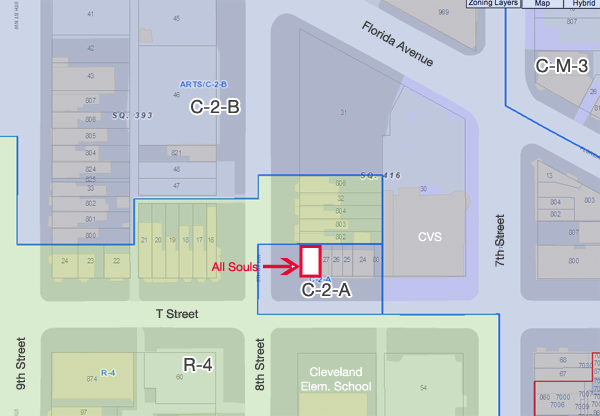 In this case, All Souls would qualify since Boston Wine & Spirits (1905 9th Street) is within 400 feet of the school. We looked up on Google Earth the distance between Boston Wine & Spirits and Cleveland Elementary School and marked a 400-foot yellow line in the map below. 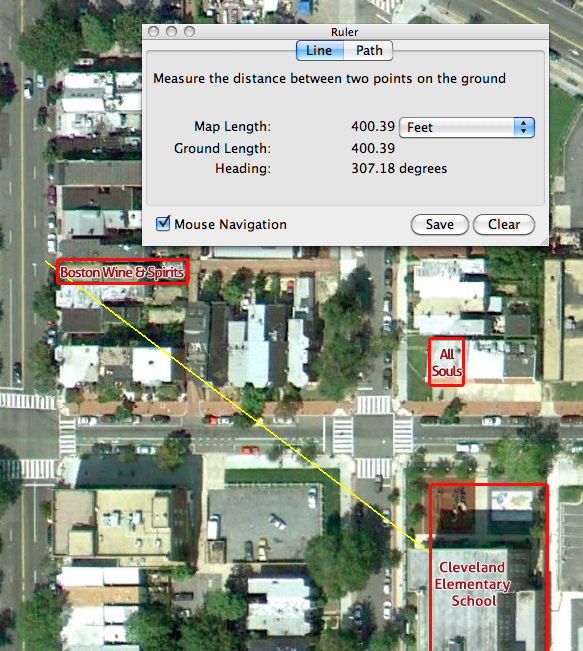 We were able to spot-check the relative accuracy of the program by measuring the right-of-way distances in Google Earth and comparing them to the numbers in the Baist Real Estate Atlas of the area. By a more generous measure, where we measure from the school building instead of the school’s property lot (outlined in red) to 9th Street in front of and thus beyond Boston Wine & Spirits, it appears that Boston Wine & Spirits is within the 400 feet. It seems the frequent, blatant, and public drug-dealing and urination a block away have not deterred these hardy souls from attending Cleveland, but the thought of a 5 pm happy hour across the street will. Few things rile up neighbors like liquor licenses. Just outside LeDroit Park at 8th and T Streets, a proposal for a new restaurant, All Souls, has elicited the ire of several neighbors. 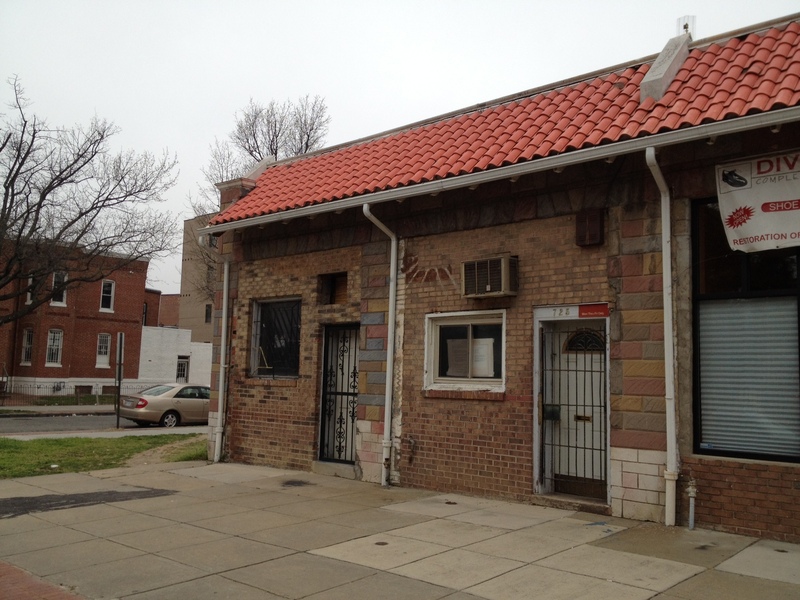 The objectors, though small in number, are trying to stop a local restaurateur from turning a vacant storefront, pictured above, into a community asset. 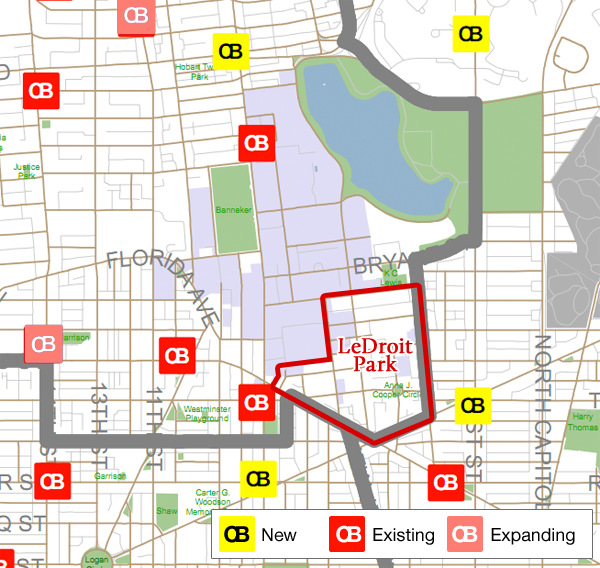 Much of this opposition is unwise and unwarranted and will hold back neighborhood improvement. We have heard the objections to All Souls for several months and would like to see this restaurant finally come to fruition. While some objections, particularly regarding outdoor noise late into the night, are certainly reasonable, a few objectors have damaged their own credibility with an array of spurious objections. The first of such complaints is that a restaurant serving alcohol across the street from an elementary school is unsavory. This is a red herring. Restaurants cannot serve alcohol to 10-year-olds and the main business of restaurants is at night, several hours after school has ended. The restaurateur has agreed to not serve alcohol before 5 pm. The most ludicrous objection we heard is that patrons on the patio on 8th Street (along the blank wall in the photo above) will leer into a neighboring house. This is another red herring as drawing one’s window blinds or curtains can easily solve this problem. Another objection is that a restaurant is inappropriate for what one objector alleged is a “residential street”. This is not entirely true. Most of the 1900 block of 8th Street is actually in a commercial zone C-2-B, which is intended for commercial uses, but also allows residential uses. 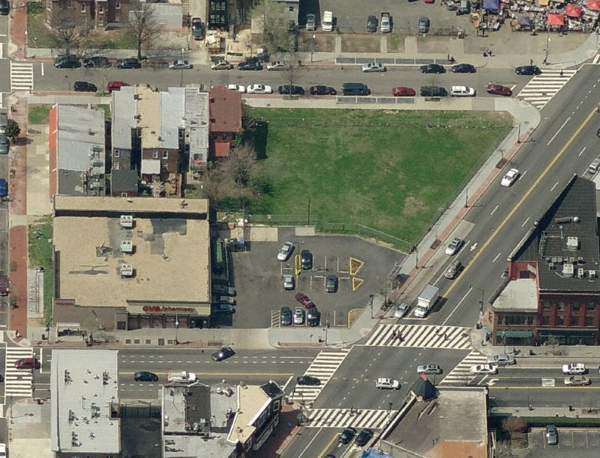 The restaurant site is surrounded by a residential zone (R-4) on three sides. Nonetheless, all zones have boundaries in which differing uses abut each other. It is the responsibility of residents to research and understand the zoning implications of where they live. It is also important for residents to understand their limitations in dictating how other people lawfully use their own property. The restaurant building, as marked in the map below, is zoned for commercial uses (C-2-A), which permits restaurants as a matter of right. The law is very clear in this case that a restaurant is permitted in this location. The issuance of the alcohol license, which is necessary for any reastaurant to survive financially, is not by right, but must be requested. Thus, it is only in the alcohol license that the objectors have a viable case to block the business. All Souls will improve the quality of life in several ways. 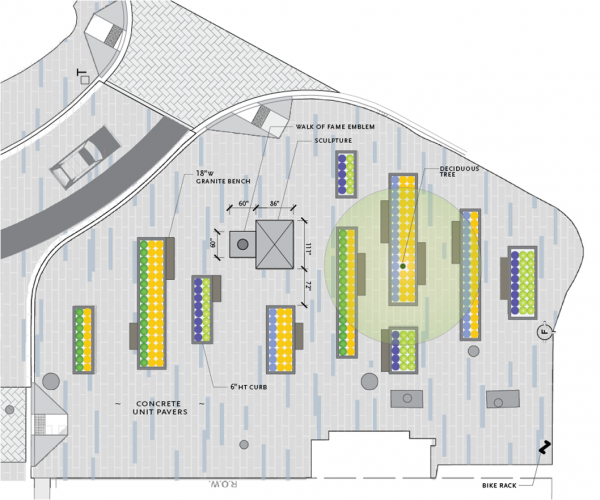 It will provide a sit-down restaurant, something we consider a desirable neighborhood amenity. It will provide more eyes on the street to deter crime. Drug dealers and criminals at 7th & T Streets will feel less confident in their criminality when they see that there are numerous witnesses at sidewalk tables 100 feet away. Most importantly, the conversion of a vacant property (pictured to the right) into a vibrant, occupied use improves the impression of the neighborhood. People rightly look upon vacant and abandoned space negatively. They look at active, lively restaurants positively. All Souls will improve the image of the neighborhood by improving the quality of life. Let’s hope the unreasonable objections of a few don’t derail a potential community asset that we suspect the silent majority supports. The Howard Theatre’s renovation, in which the District government invested $12 million, got us thinking about the role of public finance in development projects. The use of public money or, alternatively, the granting of tax abatements to private projects, elicits controversy. Opponents argue that such investments are give-aways to well-connected businessmen. In the case of the Howard Theatre, the District’s investment in the venue, which the District government technically owns, is a good investment that is economically justified. The new venue and streetscape in front will improve the perception of the area and thus improve property values in LeDroit Park. 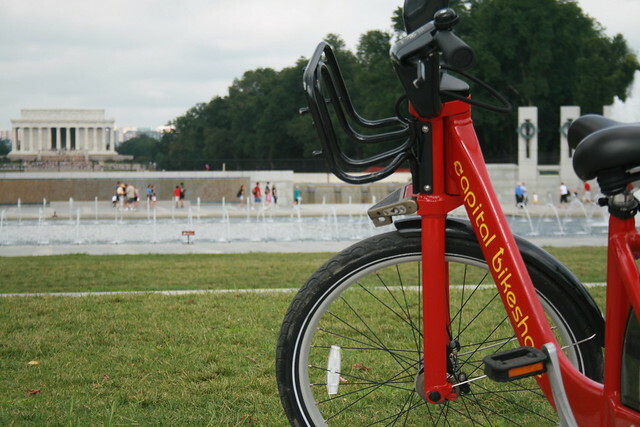 The former is an improvement to the quality of life while the latter is an improvement to the District’s tax base. Though the theater is technically just outside LeDroit Park, the path from the Shaw Metro Station to LeDroit Park typically brings people in front of the theater. When the District-owned theater was decaying and vacant, it served as an awful first impression of the area. A barbed wire fence under the awning and marquee made visitors well aware that a strong wind gust could cause the awning to collapse. The heaps of litter and scurrying of rats certainly didn’t help perceptions, either. 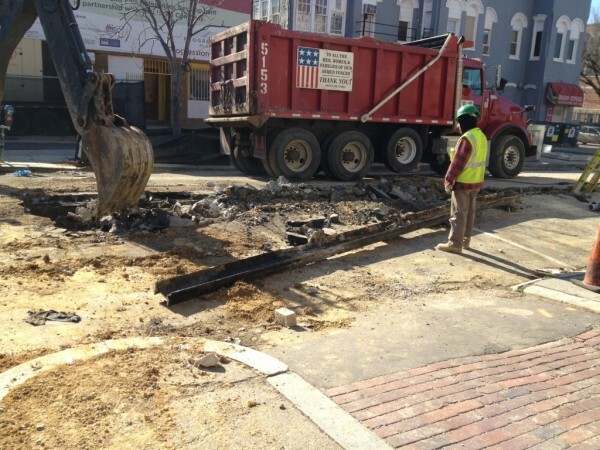 Work crews are reconstructing the entire street, including sidewalks and lamp posts, and when the renovated theater opens next month, much of the former blight will be removed. Smooth, wheelchair-accessible sidewalks will replace broken concrete. Lamp posts will provide ample light. A statue on the sidewalk and a statue atop the theatre will add to the sense of place for this important historic venue. The theater itself, renovated and gleaming, will attract patrons several nights a week and the building will have to remain in good order. 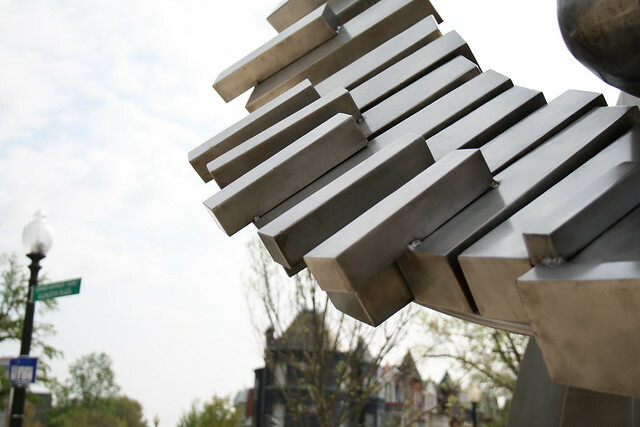 Clean surfaces and façade adornments will replace trash, decay, and danger. 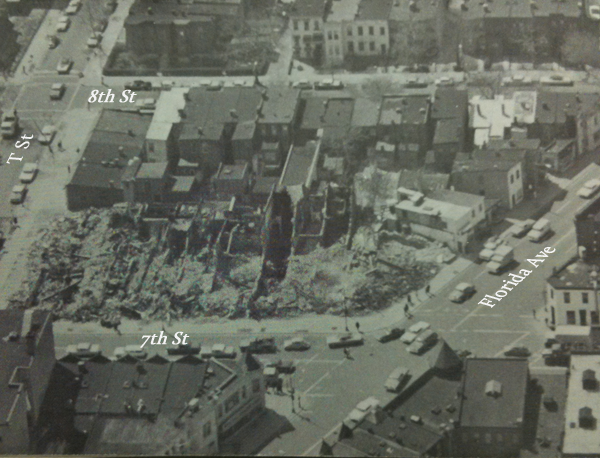 The block will be unrecognizable from before. These improvements will undoubtedly improve how visitors and residents view the block and perhaps how they view LeDroit Park. The quality of life improvements are certain. From a financial standpoint, the improvements will likely boost surrounding property values and thus property tax revenues for the District. 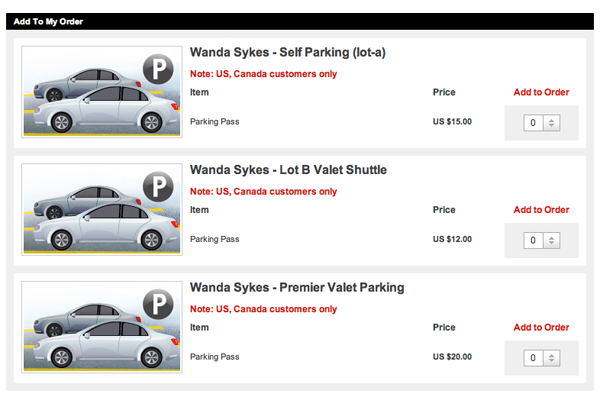 In doing so, the additional revenue may far exceed the $12 million of public money invested in the site. Correction: An earlier version of this post understated the dollar amount of the city’s investment. The Howard Theatre is set to open in April. 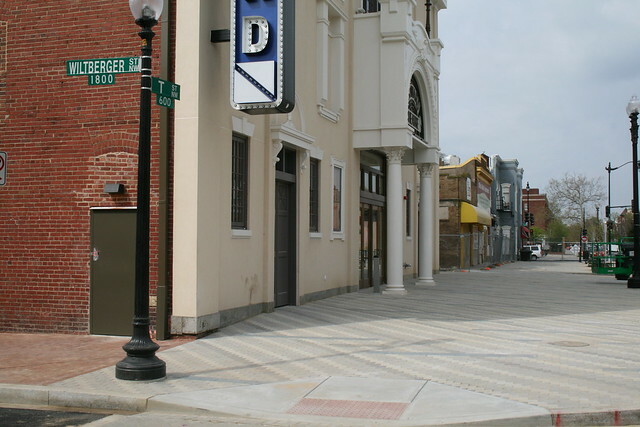 While construction crews are finishing the theater’s historic restoration, the District government is renovating the entire street in front of the theater. 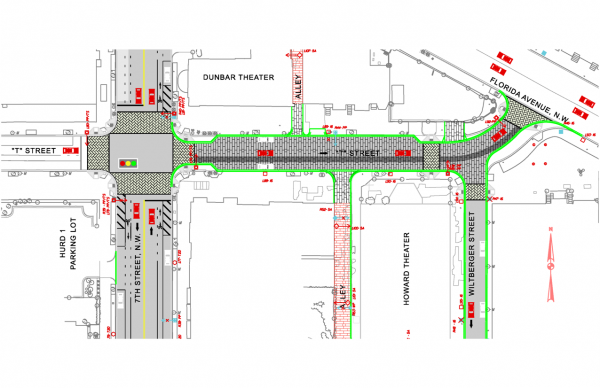 The streetscape project involves replacing the sidewalks, curbs, road pavement, storm drains, and lamp posts on the 600 block of T Street NW and along the one-block Wiltberger Street NW, which abuts the Howard Theatre. Construction work started at the beginning of February. We were able to get this photo of construction crews removing the old streetcar tracks that were paved over after the streetcar system ceased operation in 1962. 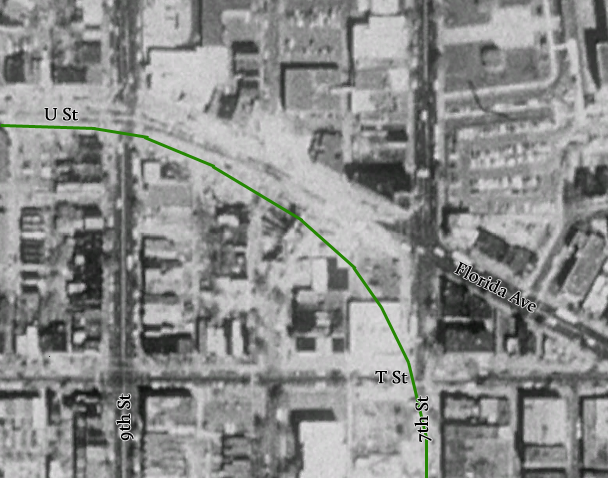 In fact the old tracks still lie under many of Washington’s streets; paving them over was cheaper than tearing them up. 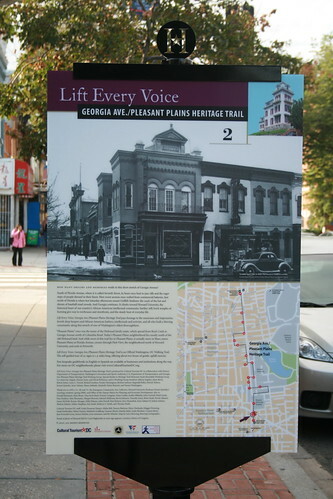 Though the streetcars ran along 7th Street/Georgia Avenue and along Florida Avenue, a 1958 streetcar map shows that a short connector linked both of these routes along the 600 block of T Street NW. 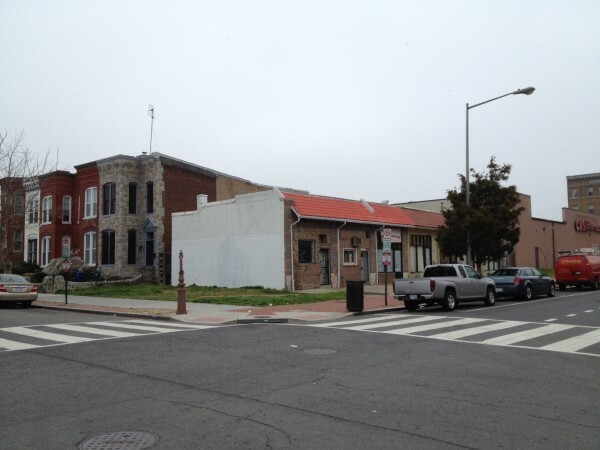 DDOT’s plans for the block are ornate and are designed to complement the restored arts venue. The street will feature decorative pavement for both the sidewalk and the roadway. We certainly hope the decorative pavement can withstand the stress of traffic once the street reopens. 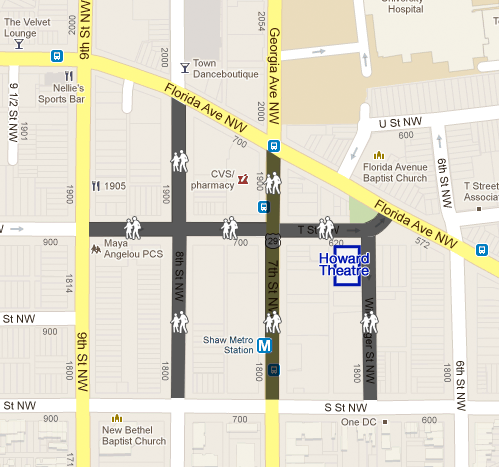 Below is the plaza section where T Street intersects Florida Avenue in front of Zenebech. Earlier today we noticed that the sculpture plinth is in place already. The deciduous tree will certainly be a welcome addition to what is now an uninterrupted expanse of concrete.